What a brilliant marriage: Bogart’s Doughnut Co. and the IDS Crystal Court. 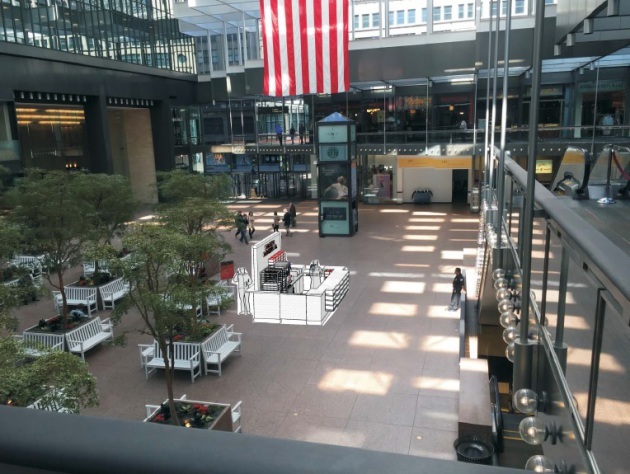 Yes, doughnut maker Anne Rucker is bringing her brilliant spin on brioche doughnuts (not to mention her cake doughnuts and other deep-fried delicacies) to a street-level kiosk in the middle of the downtown Minneapolis skyway crossroads. Opening date? Mid-July. Here's Rucker, with a few details. Q: Has this been in the works for a while? 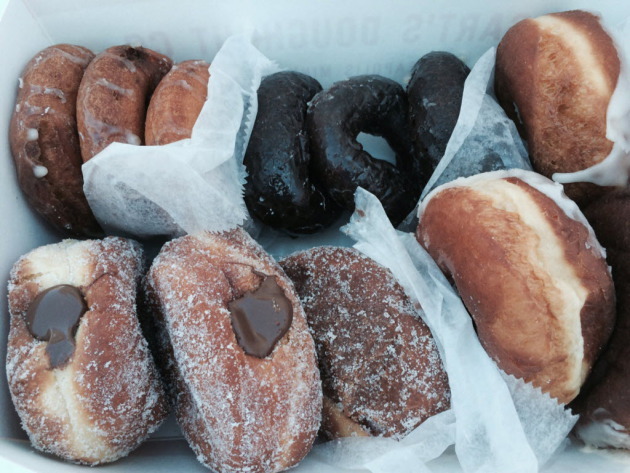 A: When Bogart’s Doughnuts was first open and it was kind of nuts, I was thinking, "What would be easy to do?" Of course, I’ve now learned that nothing is easy to do [laughs]. But opening a kiosk allows us to have more of a presence somewhere else, without building out another space. Over the past year, we’ve become a place where people stop to pick up doughnuts and bring them to work, so why not be downtown, where people walking the skyways can drop by and grab doughnuts? Doing this is really scary, but it’s also really exciting. We’ve been open for almost a year and we finally have the whole thing down, and now I’m totally screwing it up all over again [laughs]. But I’m constantly looking for another challenge. Q: What kind of hours are you planning? Is the kiosk going to mirror the shop's when-we’re-out-we’re-closed format? A: We’ll be open 7 a.m. to 3 p.m. Monday through Friday, and 8 a.m. to 1 p.m. on Saturday. We won’t have the capacity to make doughnuts for both places in the current place, so I’ve rented a commissary kitchen. We’ll have more kitchen space, so we can make more dough, and fry more doughnuts. That’ll make downtown much less of the get-here-quick-before-we-sellout thing that we have at the shop. Besides, I don’t think downtown doughnut buyers would appreciate that [laughs]. We’re going to try to make it more like, "everyone who wants them will get them," although the first few weeks – before we get our bearings -- might be insane. We hope that we get more special orders, with people ordering in advance. Q: Is this new kitchen nearby? A: I wish. The only one I could find was in Hopkins, it’s kind of a drive. I scoured around. There were a couple of shared opportunities in Minneapolis, but we have to have our own kitchen because we’re kosher. It’s located in a basement in a random strip mall, but it’s great. There’s lots of space, and a big hood. Q: Will you be offering the same line of doughnuts that you currently feature in the shop? A: Mostly the same, although I hope to do more varieties of cake doughnuts. I love old fashioned doughnuts and buttermilk bars, and I hope to test them out, too. On the brioche side, things will be reasonably the same. The problem we face now is that we offer daily specials because we don’t have space to make all kinds of specials every day. This new kitchen will give us a lot more space, and we’ll be able to make more varieties, every day. I’m not sure if we’ll be bringing in new stuff right away, we’ll probably bring things in slowly. Q: How big is this kiosk? A: It’s little, just 10 feet by 10 feet. It’s open, like a booth. It literally looks like an extension of the shop. It’s covered in white subway tile, just like our shop, and has the same kind of marble bar, and there’s a marble bar in the back where people can stand if they want to stop and have coffee and a doughnut. It’s going to be cute. It was designed by Tanek [the Minneapolis architectural firm]. They’re amazing. (Mock-up image, above, provided by Tanek). Q: So, you’ll be starting on July 15? A: That’s what the lease says, so that’s when we’ll be there. Wow, we’d better get going. Q: Will you continue to produce doughnuts at your 36th-and-Bryant shop? A: I’m going back and forth on that. I like the idea of still making doughnuts in the shop in Uptown, but I’m also obsessed about our product being consistent, and that might be compromised if we’re making them in two places. Making them all in one big kitchen will give us the opportunity to make enough so that we don’t sell out. We’ll probably still do stuff in the shop. Maybe some testing, maybe some specials. We’ll have to work it out. 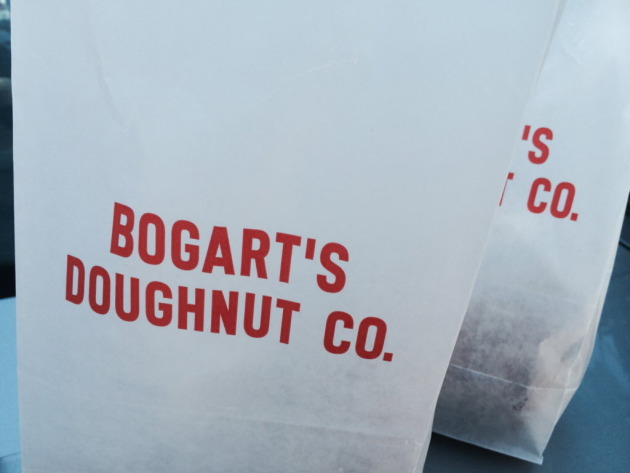 Q: Do you see this as the first of many Bogart’s Doughnut Co. outlets? A: Maybe, if this one does well. Who knows? I’m always such a pessimist. Before Bogart’s opened, all I could think was, “What if no one shows up?” But if we can consistently create a great product, it would be fun to do it elsewhere. I certainly am not opposed to it in the future. Q: Why the IDS Crystal Court? Did you go to them? Did they come to you? A: I went to them. I expressed interest a lot time ago, maybe last fall. At first they suggested a storefront, but I was trying to avoid building out a whole space, I preferred to put together something simpler, a kiosk space. There was lots of back-and-forth, lots of discussion, lots of brainstorming. They haven’t had kiosks in the Crystal Court for 20 years, so this is a very new thing for them, too. I did my research and figured that the IDS has the most foot traffic, there are always a lot of people walking around. Also, I used to work in the IDS, back in my lawyer days, so it’s a personal thing for me. And I’ve always thought of the Crystal Court as being this special place. It’s beautiful, and it has a lot of history. It was my first pick, and I feel so lucky that I got it. Q: I’m glad to hear about your plans to expand your cake doughnut line. Are they difficult to make? A: We went through a few iterations. At A Baker’s Wife, the cake doughnuts are amazing and airy, they’re so good. Mine have always been a bit chewy. Way too chewy [laughs]. We’re finally doing them the proper way. Now I’m hoping to add a few more cake flavors, and we’ll be able to do that in the new kitchen, with more space and better equipment. We’re just trying to get better and better every day. Q: Do you plan on serving coffee? A: Yes. Drip, just like we do now. We’ll probably also do bottled cold press, and juices. We don’t have them at the shop right now, but they’re things that downtown might want. Q: Right now, what’s the No. 1 selling doughnut at the shop? A: Brown butter glazed, that’s always the biggest. Vanilla bean buttercream is a close second.